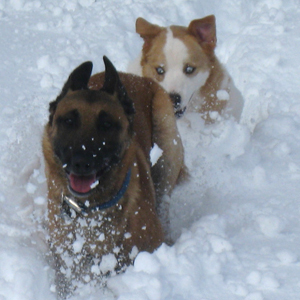 We offer pet-friendly lodging near Flagstaff Arizona at our rental Cabins on Strawberry Hill and have two dogs of our own, a Belgian Malinois (Axl Rose) and an Australian Shepard (Cally). Dogs absolutely love it here too, so we encourage our guests to go ahead and bring theirs along when they are staying here at our resort. After all, dogs & pets are part of the family too! Please read our policies before making your pet friendly cabin reservation. Noted below is our dog contract that must be signed and adhered to. The policies are very strictly enforced, so please read it thoroughly. We do require a pet fee ($10 per dog, per night). Because of the problems we have had with dog owners (not the animals themselves), we are unfortunately considering disallowing dogs. Please abide by the rules in the contract so that we may continue to keep our rental cabins pet-friendly. NOTE: Once you have made your reservation online, please email us at info@azcabins.com and let us know that you are bringing your dog(s) so we can note that in your reservation file. 1) No more than 2 dogs allowed per cabin. 2) Absolutely no aggressive dog(s) allowed. A dog doesn’t have to bite somebody to be considered “aggressive”. If it’s aggressive in our mind, that’s all we need to know. If your dog is the protective type, this isn’t the place for him. 3) Dog(s) shall not be left alone at any time unless it is in a kennel. No dog shall be left in the cabin, even in a kennel, if it continuously barks. 4) Dogs are not allowed on beds, couches or any other furniture at any time. Minimum of $50 fee for hair removal. 5) For the safety of your dog and other guests and pets, dogs must be leashed when outdoors on our property and accompanied by an adult. The resort borders Tonto National Forest, where there is plenty of room to let your dog run free if you wish to do so. 6) We do provide disposable scoops upon check-in to make it easier to pick up droppings the dog produces. Some guests bring their own. Guests must immediately clean up after their dog(s). We don’t know of anyone that enjoys stepping in it, so please pick it up. Minimum of $50 fee if we have to clean it up! 7) You are solely responsible for any damage or injuries caused by your dog(s) to all people, pets and property. 8) Your dog(s) must be licensed and current on all vaccinations as required by law. 9) Due to the frequency of allergic reactions, only dogs are permitted on property. 10) We reserve the right to refuse any dogs and limit the number allowed on our property.